Every great company has an engaged workforce, and nurturing a culture of engagement is at the heart of great leadership—employees who really care about their work, their coworkers, and the organization can supercharge a company’s success. But for many years, engagement has been suffering. 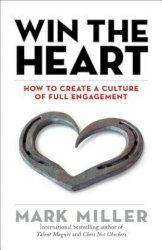 Gallop reports that 70 percent of employees are not fully engaged on the job. Mark Miller draws on more than forty years of leadership experience to show leaders at all levels how to change the conversation and create real competitive advantage in the process. Mark Miller started his Chick-fil-A career in 1977 working as an hourly team member. Since then, Miller has provided leadership for Corporate Communications, Field Operations, Quality and Customer Satisfaction, Training and Development, Organizational Effectiveness, and Leadership Development. Miller’s desire to encourage and equip leaders has taken him around the globe. He is the author of seven books, two coauthored with Ken Blanchard.